To, Cc and Bcc: What’s the Difference? Most people know what happens when they address mail TO: people when creating a new message. However, they are less sure about the two other options: CC: (carbon copy) and BCC: (blind carbon copy). If you are sending the message to only one address then the TO: option should be used. If you are sending the message to multiple addresses then the BCC: option should be used so that each person sees only their own address. The CC: option essentially works the same way as the TO: option. Everybody will see the addresses included there. The main difference is intent. In most cases you'll use the CC: option when you want to keep someone in the loop but no action is required AND all parties know the address. See the example below. Blind Carbon Copy (BCC:) will hide the address list from all the recipients. Only the person's own address will appear. Some email programs place the phrase "undisclosed recipients" in the address field instead. If your email program insists on at least one TO: address, enter your own. This will also let you see the sent message as your recipients do. You may wish to indicate the general nature of the address list at the beginning of your message so that recipients have an idea of who the other recipients are (if necessary). Using a generic phrase such as "forwarded to the production team" lets people know who has received the message without revealing names or address information. Carbon Copy will reveal the address(es) listed but is used in place of the To: to indicate that the message is sent to those persons for information purposes only. It is not used when the other recipients may not know the address. Last year sales increased by 15% and costs decreased 5%. only Jim White (the sender) and Sam Jones (BCC:) are aware that Sam Jones received a copy of the message. In a much more likely scenario where a large group is blind carbon copied you can appreciate the result — a message free of a long list of addresses and the preservation of individual privacy. When sending message to large groups of people on a frequent basis it is useful to set up a "group" address to save you the effort of selecting all the recipients each time you send a message to the group. Your email program will have the ability to do this using a "Group" function in the address book. Create a group for each category you need. Add or copy all the appropriate addresses into each group as appropriate. An address may appear in more than one group. A group may contain anywhere from one to dozens of addresses. Islandhosting.com is a local hosting company with a lot of expertise. They've been around (as Islandnet.com) since the late 1990s. Highly recommended. 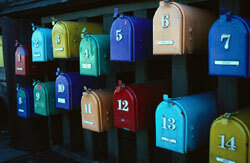 ConstantContact provides email marketing services and more. MailChimp provides a e-newsletter service. Use the Blind Carbon Copy (BCC:) addressing option to select the group address when you want to send a message to the whole group. Everyone will receive the message listed with that group address, yet no addresses will appear on each message except that of the sender and possibly each recipient only in their own message. The way you set up your group lists makes a big difference. Opt-in is always preferable because it places the onus on the person to get onto your list. Don't assume that everyone wants to receive your latest joke or to know about your big sale on Friday. See Ethical Net Commerce for more about opt-in. Many lists now ensure that a person really has opted-in by sending a confirming message in reply to any request to get onto their list. If no confirming reply is received the address is removed automatically from the list. You should always provide some way for people to opt-out with each message. The most common is to reply to the message with UNSUBSCRIBE in the subject line. Keep in mind that unscrupulous list owners (spammers) also include a remove option in their messages. Most such requests are ignored (the best you can hope for). The rest are used to confirm your email address so they can sell it to other spammers (the worst scenario for your privacy). Unless you're certain the sender is legitimate, you're better not using any unsubscribe options. This is where companies that specialize in group email can help (see Dealing with Larger Groups. Such legitimate companies can be trusted to deal with the removal of your email address from a list without compromising it. Using email for business is critical these days and you want to do it right. Avoid sarcasm or witty remarks. It is easier to offend someone via email than in person because the tone of voice and facial expressions aren't available as clues. These 31 crucial business email etiquette tips can help you keep on track with the dos and don'ts of business email communication. When dealing with email there are some other issues that this site deals with in other locations. If you use Outlook or Outlook Express (an obsolete program) or compose your email messages with MS Word, you'll need to know that you may create an attachment called winmail.dat that is invisible to you, but creates problems for viewers using other email programs. Similarly, if you create email newsletters, you'll want to view the suggestions to create the best experience for your readers. Businesses that collect personal information are also required to meet the requirements of other federal and provincial privacy legislation including PIPEDA and BC's PIPA. Few things are as irritating as receiving a message only to find that your email address is listed along with email addresses for people you don't know. Not only is this poor etiquette, but it also invites misuse by any of the recipients or anyone they might forward the message to. When people provide you with their email address — either directly or by sending you a message — there is the implicit expectation that you will not reveal it to others without their permission. Just as you wouldn't appreciate your place of employment giving out personal contact information, many people feel the same way about their email address. In fact, privacy has become a serious issue on the Internet and this concern will continue to grow as people realize the commercial value of their private information and as they fight a losing battle against spam (unsolicited and unwanted commercial or non-commercial email). Spam is an issue of consent, not content. Be sure the person you're sending to has a reason to expect your messages or they're likely to treat your message as spam. Some jurisdictions have severe penalties for senders of unsolicited mail. You should also be sure that each person will find your mail appropriate, and not a waste of their time. The volume of spam has become so large compared to legitimate mail that it threatens the future of email. I'm sure that you dislike spending an additional 80 percent on your Internet bill to pay for spam! There is more information about this issue on the Avoiding Spam page.